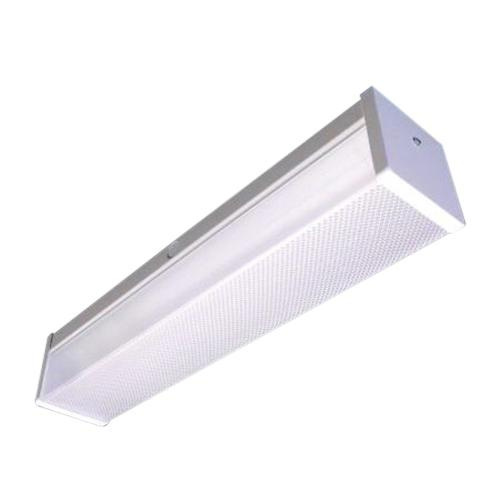 Lamar Lighting H-series utility fluorescent luminaire is suitable for surface or pendant mount, individually or in continuous rows. It is widely used in stairwells and corridors and is wired with factory-installed emergency battery backup. Ends of this luminaire retains the diffuser with positive engagement by reducing vibration hazards. Wireway covers are die-formed for durability and attaches easily and securely with two screws for easy installation. Ample knockouts provided on back of Luminaire for convenient installation. It features prismatic pattern on the bottom and linear refractive sides for brightness control and 180-Degree uniform light.